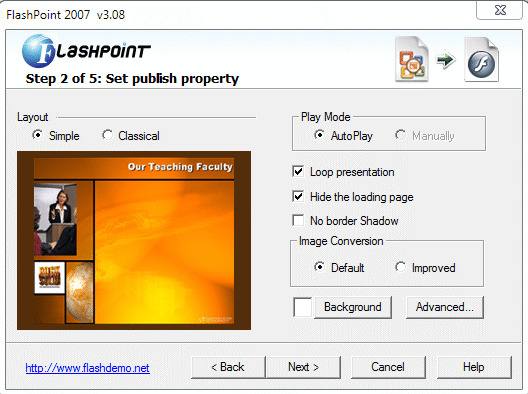 Ppt2flash helps you convert PowerPoint file to swf easily and quickly. just click a bulton to turn your presention into a compelling Flash course, really save more time.what's more, respect all the features in ppt. support ppt 2003,2007,2010. 15 days FREE trail is available. 1. FlashPoint Pro supports 99% PPT animations, transitions, effects, 14+ shapes, table, and chart. 2. Small output file size, ideal for posting output flash movie to websites, intranets or for creating self-running CD-ROMs. 3. User-friendly interface. Ease to use. Fast conversion speed. 4. Greater and Easier Accessibility. 5. Capture most video clips (MPG, MPEG, ASF, WMV) from PowerPoint file and recreate in the output flash. 6. Support MP3, WAV, and WMA audio. MP3 Toolkit - MP3 Toolkit is a free and powerful Windows app includes MP3 converter, CD ripper, tag editor, MP3 cutter, MP3 merger and MP3 recorder for users who want to handle MP3 files easier. Free Convert, Rip, Merge, Cut, Tag Edit and Record MP3 All-In-One. WavePad Masters Edition - WavePad Masters Edition for Windows is sound editing software for Windows. This program lets you make and edit voice, music and other audio recordings. You can use the cut, copy, and paste feature to create your own audio file. Crescendo Music Notation Editor Free - Crescendo Free is a simple and intuitive way to create musical compositions. Crescendo allows you to create, save and print your music compositions on your Windows PC. Crescendo Free comes with a variety of notation symbols, key, and time signatures. iClone - Integrated with the latest real-time technologies, iClone7 simplifies the world of 3D Animation in a user-friendly production environment that blends character creation, animation, scene design and cinematic storytelling. Nero Platinum - Empower your digital life with Nero Platinum 2018 for high-performance multimedia. Create, edit, burn, convert, organize, and stream videos, photos, and music. Enjoy 4K quality, even play back files in HEVC and also with subtitles and album art. Dexster - Record, edit, add audio effects, mix and burn your digital audio files. CrazyTalk Pipeline - CrazyTalk is the worldâ€˜s most popular facial animation software that uses voice and text to vividly animate facial images. CrazyTalk Animator - CrazyTalk Animator (CTA) is the world's easiest 2D animation software that enables all levels of users to create professional animations with the least amount of effort. Mixcraft - Record,mix and edit your tracks with this user-friendly music recording software. Mixcraft 8 is driven by a new, lightning-fast sound engine, featuring advanced audio and MIDI routing, native sidechaining, and Audio Control.